To help you learn Method, let's create an activity. In the previous onboarding article, you created a lead. This article will continue where that left off and will guide you through creating an activity. An Activity is a record of any interaction you or your company has with anyone in your contacts app. These interactions can be anything: an email, a phone call, a meeting, a reminder to do. 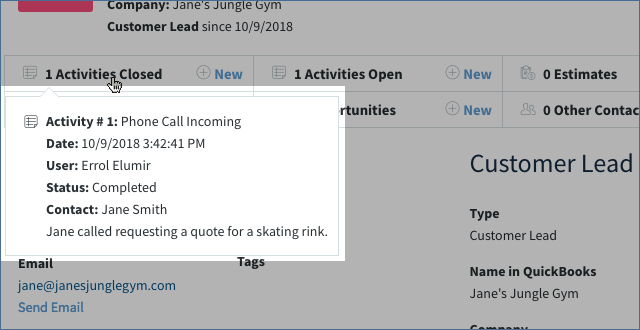 When viewing your lead, you will see closed and open activities in the App Ribbon for the contact. At the moment, there are no activities because this is a brand new lead. Time to create a new activity. In this scenario, let's say Jane called us requesting a quote for a product. We will create two activities: One to record Jane called us, and another one to remind us to follow-up with her. 1. 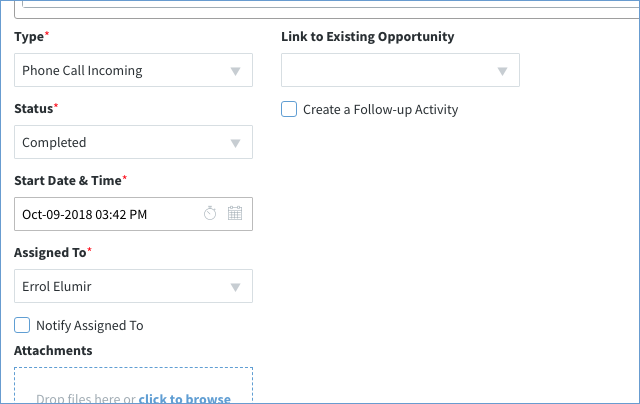 On the app ribbon of your new lead, click ⊕ New by Activities Open. A new activity screen will open up. At the top, you will see pertinent information of the contact you created this activity for. If need be, you can add in tags to further categorize the activity. 2. The main area will have comments about the activity. 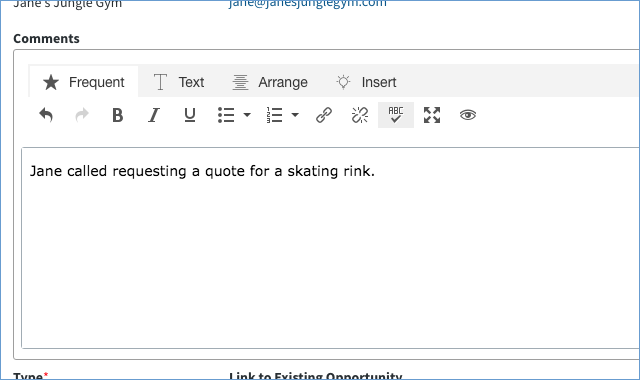 Write "Jane called requesting a quote for a skating rink." In a real life scenario, you'd probably put in more details about the phone call. Type: Change the type to Phone Call Incoming. Status: The status will automatically change to Completed. For all intents and purposes, you've filled in enough information for the new activity. However, this activity was to log you got a phone call. To ensure nothing falls through the cracks, it'd be great to create a follow-up activity. In our scenario, we'll create a second activity, a follow-up to this one, to check up on the estimate we will eventually send her. 1. Check Create a Follow-up Activity. A new section will become visible for you to fill in information. 2. Fill in the appropriate activity details for the Follow-up. 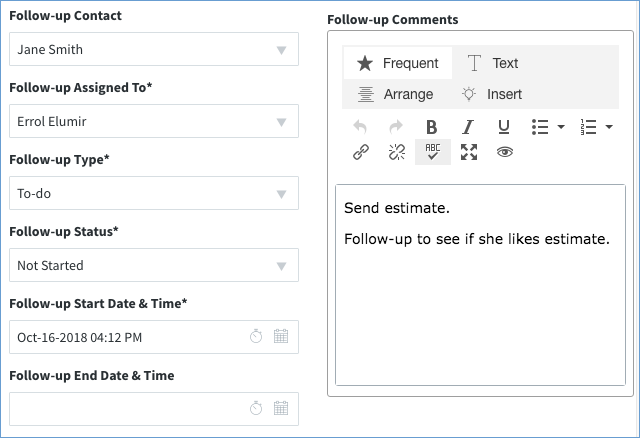 In this scenario, I've changed the Follow-up Type to To-Do, and I've updated the comments to state we are sending an Estimate and expecting a reply. 3. At the bottom of the screen, you will find a number of buttons. Click Save & Back to create your two new activities. When you save your activity, you will be returned back your lead and you will see a change in the app ribbon. Remember, we created two new activities. One was immediately closed for it logged we received a phone call from Jane. The other is for us to follow-up with Jane to make sure she liked our estimate (which we haven't sent yet). By clicking on the app ribbon, you can see a small preview of the associated records. For example, clicking on Activities Closed will show you the completed activity we just created. And if you click on Activities Open, you will see the activity you created which hasn't been completed yet. You have now created a lead and associated activities to keep track of the interactions you've had with your lead. If you recall, we did promise her an estimate, so our next goal in the onboarding series is to create one.